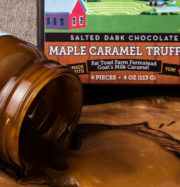 We boil our best syrup to a higher consistency, stirring it as it cools to create these fresh and delicious maple treats that are creamy but not too sweet. 25 pieces (.625 lb.) Our pure maple sugarcakes are a fresh product with no crystal coating or preservatives. Please open them immediately after you receive them and enjoy within two weeks of opening. Sugarcakes are the most traditional way to enjoy the taste of maple. Sap is boiled beyond the syrup stage and poured into maple leaf molds. 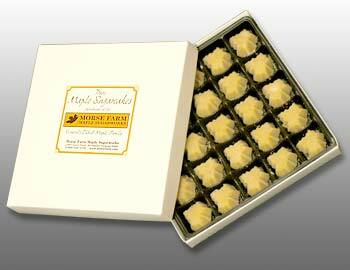 Sugarcakes packed in a special molded form and placed in a candy box to insure delivery, fresh and intact. 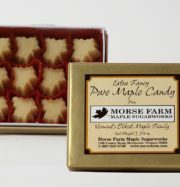 Our pure maple sugarcakes are a fresh product with no crystal coating or preservatives. Please open them immediately after you receive them and enjoy within two weeks of opening.